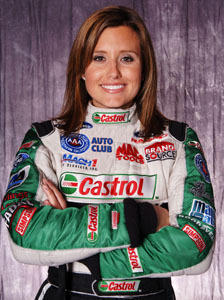 YORBA LINDA, CA (January 25, 2011) – Two-time reigning Mac Tools U.S. Nationals Champion Ashley Force Hood, a top three finisher in the NHRA Full Throttle driver standings each of the last two seasons, announced Tuesday that she and husband Dan are expecting their first child. Moments after informing members of her Castrol GTX team of the news via satellite hook-up with John Force Racing East in Brownsburg, Ind., Force Hood told those assembled for a press conference at JFR corporate headquarters that she will take a temporary hiatus and will not compete this year for the Full Throttle Championship. The 28-year-old graduate of Cal State-Fullerton instead will focus on motherhood and her new responsibilities as president of John Force Entertainment, a JFR subsidiary that has been charged with responsibility for building the JFR brand on a variety of new and existing platforms. The NHRA national record holder for Funny Car speed (316.38 miles per hour), Force Hood admitted that she is excited about both her pregnancy and about finally being able to make use of the college degree she earned in Radio, TV and Film. “This past November, after watching my dad clinch his 15th championship, Dan and I decided we would try to start a family,” said the 2007 NHRA Rookie of the Year. “We knew it was unlikely to happen in such a short amount of time and, if it didn’t, I could still race the 2011 season and we’d try again next winter. “We felt that if God wanted it to happen, it would happen. Well, God didn’t waste any time and I am pregnant and due at the end of the summer. Dan and I know there is always a risk at the beginning of a pregnancy so we waited as long as possible to say anything to make sure everything was all right and there were no problems,” she said. Force Hood also will spend time coaching youngest sister Courtney, who this year will be testing a BrandSource Ford Funny Car in anticipation of a later pro debut. congratulations ashley and dan.sorry that we won’t get to see you race in 011.look foreward to 012.does this mean that coil might come back,in place of neff,or is he staying retired. Ashley., I am a 71 yr old retired navy person so I’m not trying to be “cute” with you.